The second of our regular feature (you can catch the first one here)… our little peoples’ Book Of The Week – this week it’s Huey’s! This book was an instant winner all round in our house. It’s a perfect mixture of being really funny, lovely to look at, and with a great underlying message that appeals to both kids and adults. 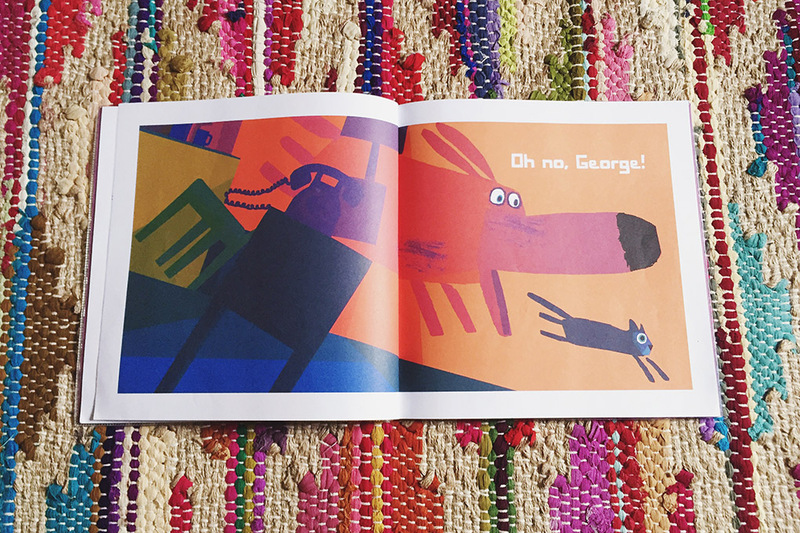 It follows a day in the life of George, a beautifully illustrated and very loveable dog who struggles to rein in his instincts to behave well for his owner, Harris. We see George meet a series of temptations that he tries hard to resist, sometimes unsuccessfully, sometimes successfully. It’s a wonderful book that shows that good people mess up sometimes, and that it’s not the end of the world – there’s always chance to change what you’re doing and say sorry. Why does Huey (19 months) love it? It’s got minimal text and big, bold, fun illustrations so for a younger toddler like him, there’s nothing too overwhelming or difficult to understand in there. It’s really funny and every time George messes up, Huey howls with laughter and looks at me with absolute delight! He really enjoys the anticipation of when George might do something he shouldn’t, and he loves the repetition of, “Oh no, George!” when he does. He loves watching George be naughty but equally he loves telling him off when he does – turns out he’s quite strict! Touchingly, he also pulls a really sad face and kisses George when he says sorry and feels bad about what he’s done – he genuinely wants to comfort him and show him that it’s ok.
Why do I love reading it to him? Its gorgeous colour palette and great illustrations appeal to the design-magpie in me, but I love it mainly just because it’s so much fun to read. 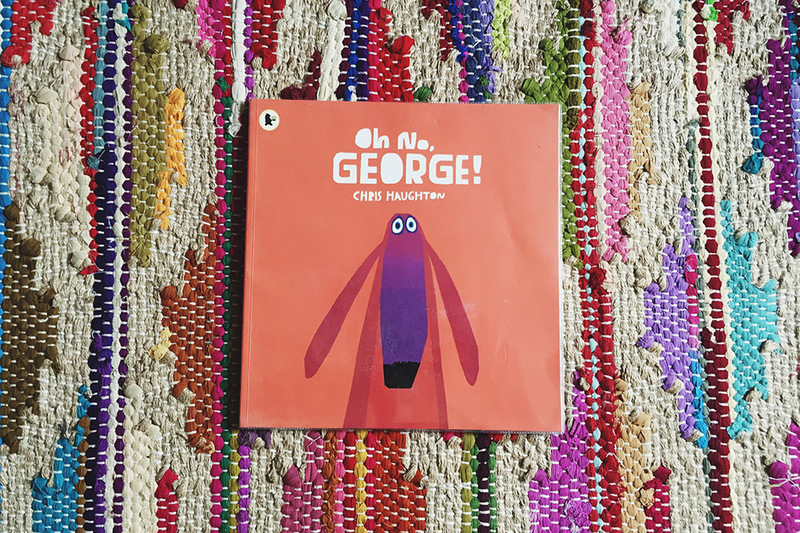 It’s really amusing and George is genuinely really loveable – and the bit where he apologises to Harris with a tear in his eye by trying to give him his favourite toy gets to me every time! Yes I am a total softie. George’s facial expressions are so beautifully drawn and say so much more than any words would. I love the message – that it’s normal to behave in a way that you’re not proud of and that you can show you’re sorry by changing your behaviour, that you can be a good person but still make mistakes. I think it’s a lovely message for toddlers who, in exactly the same way as dogs (and sometimes adults! 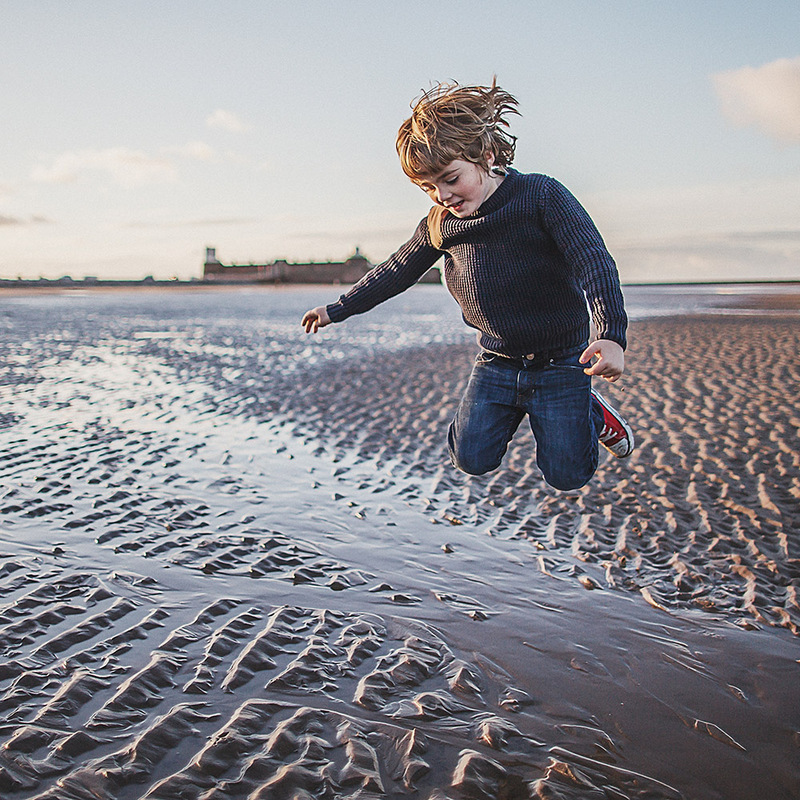 ), really struggle with self-control and need to understand that if they mess up, it’s not the end of the world and that there are things they can do to make everything better again.